Your home (or room) should reflect who you are. If someone were to walk into your home, they should know that it’s yours. The best way to achieve this is by including accessories that reveal your hobbies and interests. What’s important is that you distance yourself from what the stores are telling you to buy. Often times we are drawn to ideas that are trendy or pre-done: “Of course this white lacquered elephant statue would look great in my bedroom!” But is that really you? Maybe not. Instead, aim for pieces that compliment your personal clothing style. 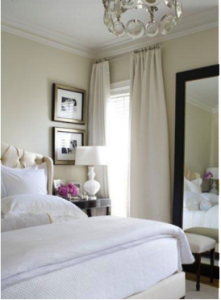 You may be surprised to discover that styling an outfit isn’t too different from decorating a room. So take a look in your closet. What colors are you drawn to? Do you prefer mod or modern? Clean cuts or lacy ruffles? Use your taste in clothing as a style guide for your home—it’s an easy way to ensure your space is 100% you. If you have any additional suggestions, please share them with us! Look forward to hear from you.